How can I make certain posts stand out on my social media wall? In Walls.io you can highlight or "star" individual posts in your Dashboard in order to make them stand out to the visitors on your wall. There are a couple of options that come into play here, so let me walk you through it – with a bunch of painstakingly taken screenshots, of course. Go to Moderation in the back-end. 2. Simply scroll to the post(s) you would like to highlight or use the search bar to look for the post(s). When you’ve located the post in question, simply click on the little star to highlight it. The posts you highlight will show a tab with a star on it which will fit the color scheme of your tiles. If you’ve set your wall up to sort posts by time, starred posts will simply show up where they would otherwise too. But you can also set Walls.io up in a way that will push starred posts to the top of your wall for a while. To make sure that starred posts are displayed at the very top of your wall, you have to activate “Post Rank” by going to Settings > Design. 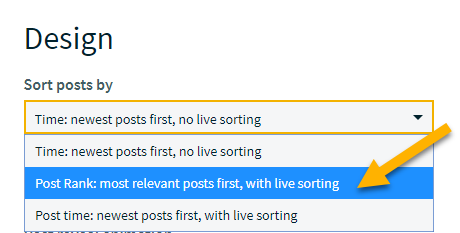 In the very first drop-down, called “Sort posts by”, choose “Post Rank: most relevant posts first, with live sorting”. Posts you highlight will be sorted to the top of the wall, just like giving an individual post a “boost”. It is however not a “sticky” function, as highlighted posts will gradually slide down on your wall, although a lot slower than normal posts do. If you want to remove a highlight you can easily do this by going to the post in your back-end and clicking the little star to deactivate it again.